I mean I was totally late on the avocado toast with my version the avocado hashbroffle, I’m late on the Sriracha kick and you could probably even say the same about chia seeds. Is a trend just a guess or luck of the draw? While this blog has been about the ‘leftover’ trends, you know the ones that are months late missing the entire purpose of the trend. In the fashion world I would be wearing sweaters in the summer and pastels for Christmas. So I thought it was time I step up my game and try to get on top of the hottest food trends for this year. Go ahead and say it, your late and this is lame. ->WAHAHAHA<- Can someone please fill me in on how I can be a trend setter, or at least a part of the trend? Apparently, I need a little help in this department. So in my best interest I’ve done some research on the top predicted trends (in food) for 2015. The use of insects in power foods – Think grasshopper tacos and ant guacamole. Harissa is the new Sriracha – Harissa is a a spread of dried chiles, garlic, tomatoes, caraway, paprika, coriander, and olive oil and can be commonly used as a ketchup. Peas – More specifically using peas as a plant based protein source that may be found in bars, breakfast dishes, etc. 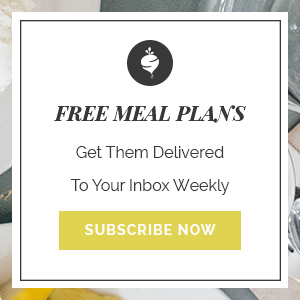 Cauliflower is the new Kale – Cauliflower is an extremely versatile food and can be used to mimic numerous other ingredients. Kolache the new baked good – It’s about time, in my opinion there is nothing better than a soft pastry with a fruit filled center. Sign me up! Sour is the hot flavor of choice – Think pickled and fermented foods such as sauerkraut and kimchi. Ramen Everywhere – Once notably just dorm food Ramen has made a comeback and can be found in some top restaurants in the U.S. That is one big leap for Ramen. Food Goes to extremes – From the off the cuff ideas to the conservative use of traditional foods, both have set a cascade of viral ideas that will only continue this year. I must say, I’m liking where they are going. Some are frightening, others give me excitement. Can you say kolache? But I am bound and determined to keep up with the blasted trends to better serve you my readers. So what are your thoughts? What trends do you want me to conquer first? Leave me a comment below to let me know. 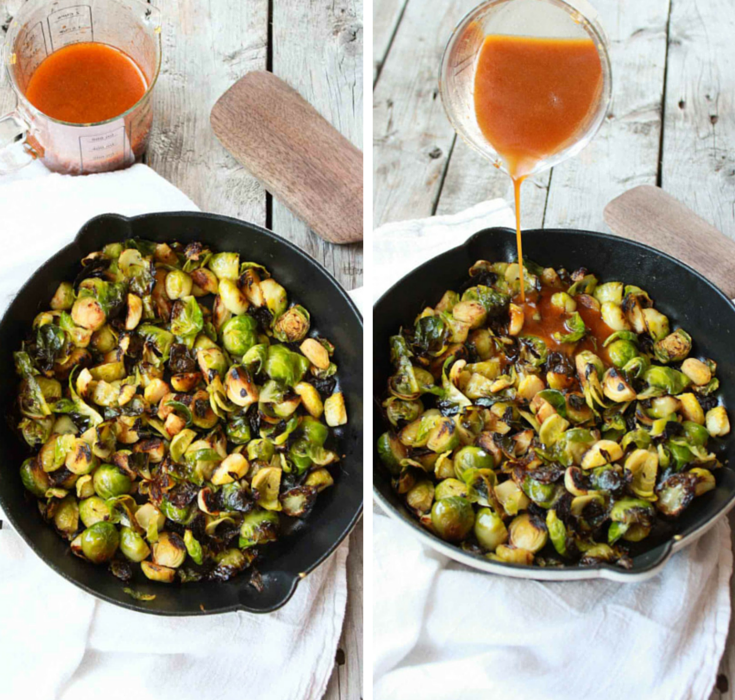 While you’re helping me to think up the latest new trends for the blog I would like you to soak in this ‘old’ but still amazingly delicious Sriracha Fried Brussels Sprouts. You may just wonder in all of its hype how something so delicious could come on quickly and leave just as quickly. 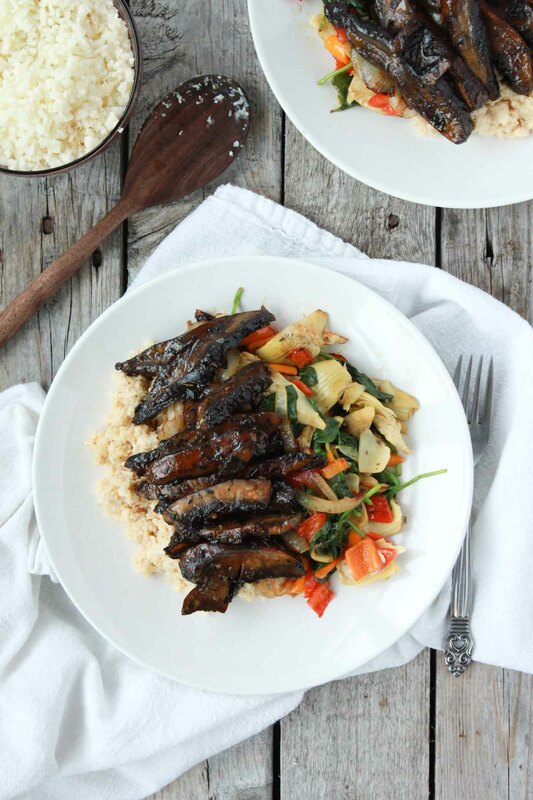 For this recipe is sure to be a staple in our house. 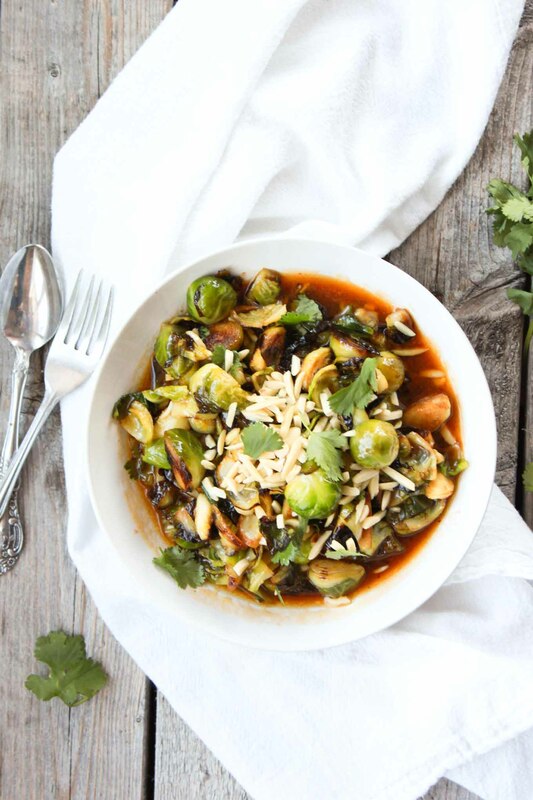 That heat paired with the sweet blows the roof off traditionally bitter brussels sprouts. You know the ones that no one wants to eat. 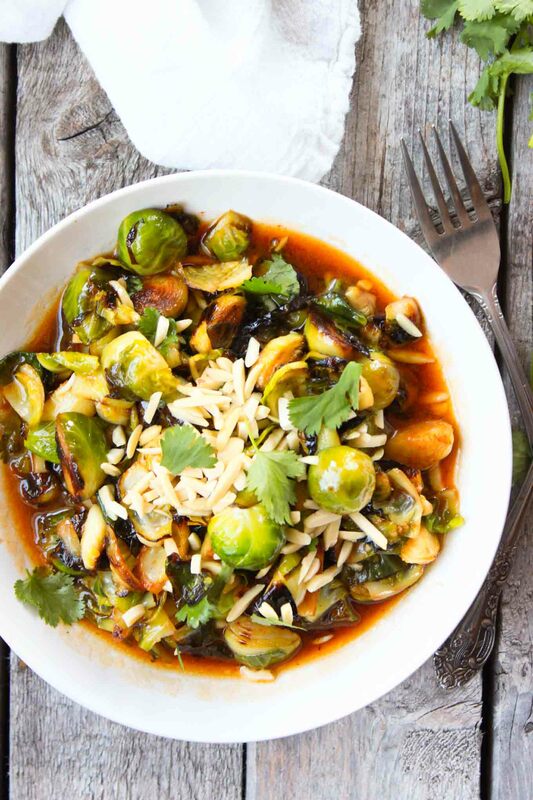 You’ll never turn your nose up at brussels sprouts again. For all those trend setters our there, share the love, what do you want to see? Wash and cut brussels sprouts in half or quarter. In a large skillet heat oil over medium heat. 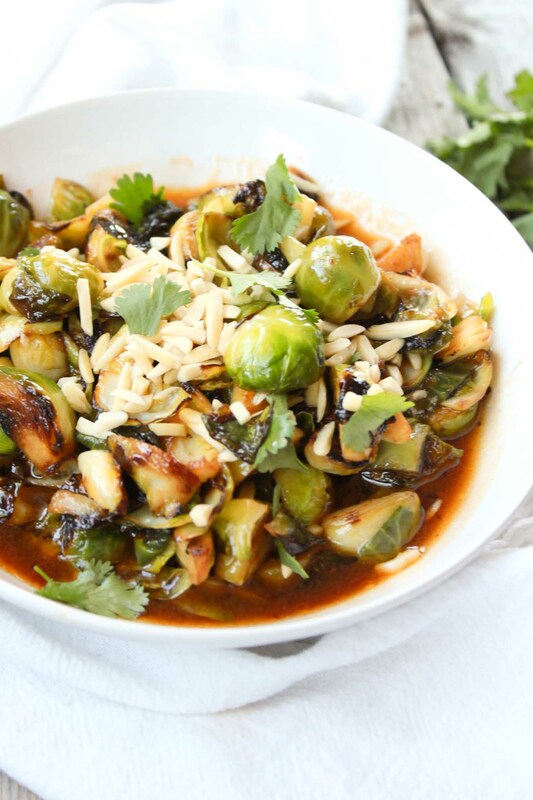 Once sizzling add brussels sprouts and cook until crispy, stirring to crisp all sides. Add apple cider vinegar, honey, Sriracha, lemon juice, tamari sauce, minced garlic, and ground ginger in food processor or blender. Once mixed slowly add in olive oil while continuing to mix. Remove brussels sprouts and coat in vinaigrette. Top with slivered almonds and chopped cilantro.